Visitor information for St Luke's. If you are planning a visit to St. Luke's and have a sat nav our postal code is L37 2DF. Further directions are given on the visit us page. If you can't find what you need on this website please use the contact us page. St. Luke's is on St. Luke's Church Rd in Formby. This is a bus route, so please park carefully on the same side of the road as the church. For busy services or when the weather is good and there are a lot of visitors to the beach it may be necessary to park in nearby roads, so please allow yourself time. For people with disabilities we try to reserve parking space near to the church using cones, However, at funerals and weddings the reserved space is for official cars. Access to the church and meeting room does not involve steps. There is a slight slope to the church, but it should not restrict access. 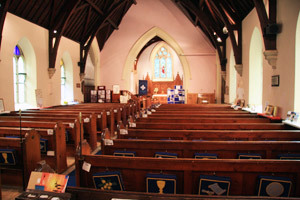 Inside the church there is space for wheelchairs and level access to the communion rail. Also we invite people who can't get to the communion rail to let a sidesperson know and we will make arrangements for Communion to be taken to a convenient place in the church. For parishioners who are housebound or in a nursing home we can arrange to take Communion to their place of residence. The meeting room, adjacent to the church, has toilets, including disabled, and baby changing facilities. The church has a sound reinforcement system with an induction loop. There is also a video camera that is used when the view of proceedings may be limited.